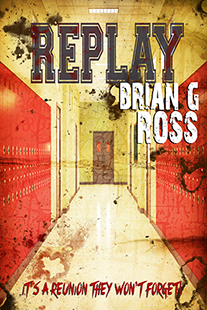 Brian G Ross has just had his novella “Replay” released through Australian publisher Dark Prints Press, who also published my book Vaudeville last year. Give us a bit of an idea about your background and how you got into writing. I’ve been writing since I was a child, and (although I didn’t admit this to anyone back then) it is really the only thing I have ever wanted to do with my life. As a lot of writers will tell you, it was originally an escape. Not that life in the real world was particularly bad, just that it was never as interesting or exciting as those environments you could build in your head. Tell us where the inspiration came from for Replay? Well, the original incarnation of Replay was written in the early months of 2001, while I was at university. I’ve always wanted to write a school-based horror story, and this is what came out. I think it’s a bit like The Breakfast Club, as seen through a funhouse mirror. The version you can read today has been substantially overhauled. What was the most satisfying scene to write in Replay? Replay has four central characters, each with their own dedicated scene. I enjoyed getting to know each of my protagonists, and discovering their strengths and weaknesses. The longer format of the novella allowed me to establish their positions and explore their motivations in a way that a short story does not, and I am thankful for that. Over the years I have read (and enjoyed) most of Stephen King’s material, along with Dean Koontz. If I was struggling to find something to read, I would dip into their back catalogues, and they were my two basic food groups for many years. I discovered Ed McBain’s 87th Precinct novels when I was in my twenties, and most of them are very good indeed. In one month I got through fifteen of them! His minimalistic approach to the police procedural genre is something I truly admire. What’s the last thing you read that really blew you away? That’s a difficult one. Probably Robinson Crusoe, which I didn’t read until I was in my thirties. I went into it thinking the prose would be dense and that the whole thing would be a struggle, given that it was first published in 1719, but I was wrong. It’s a fantastically engaging story that rarely feels as old as it is. Highly recommended. I have several projects on the go at the moment – I tend to be a bit of a creative platespinner, in that I rarely focus on one thing. The next story that should see completion is called Wyrmhole, and – other than a couple of very short flash pieces – it’s my first foray into sci-fi, so I look forward to seeing how that is received.